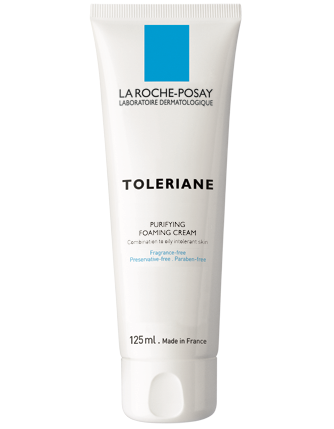 Recently I received some sample, experimental sizes of La Roche-Posay's new Toleraine line coming out. This is a new line meant for oilier, sensitive skins. It is the start of their prebiotic line. I tried three products in the line and although my skin is normal, I did very well with every one of the products. This is one of those cleansers that I absolutely love to use. A creamy, foamy cleanser that upon contact with water turns into a wonderful lather that just cleanses the skin, making it feel clean and amazingly fresh and gently removes impurities and makeup from the skin. This one doesn't really have a scent. It soothes combination to oily skins. It has glycerin and sorbitol to moisturize the skin and prevent over drying. It also has a soothing, creamy texture. Anti-oxidant thermal spring water soothes the skin. This cleanser provides gentle yet effective cleansing and makeup removal and is dermatologist tested. It is best for delicate, sensitive skins to combination and oily skins. To use, make this a daily cleanser for sensitive and oily skins. Lather up in the palms of the hands with lukewarm water. Apply to the face using gentle massaging movements, avoiding the eye area (it will sting). Rinse thoroughly and pat dry without rubbing. Finish with a mist of La Roche-Posay Thermal Spring Water. I just love this cleanser. It leaves my skin feeling amazing yet not dry at all. That is what I want in a cleanser. Perfection. Even when my skin gets drier in the winter I can still use this even for fear that my skin will feel dry after use but it doesn't. That is how nice this cleanser is. Ceramide-3: an essential ceramide naturally found in skin. 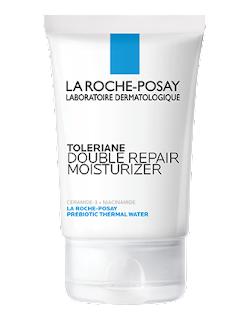 High concentration of La Roche-Posay Prebiotic Thermal Water: with hydrating, soothing, and anti-oxidant properties. Glycerin: a moisturizing agent that naturally attracts water to skin. Niacinamide: a form of vitamin B3 with soothing properties. Use as a daily facial moisturizer to hydrate and soothe the skin. Apply to the face and neck morning and evening. This moisturizer is soft, oil-free and absorbs easily into the skin. It can be used by all skin types but is recommended for sensitive skins. It is non-comdegenic, fragrance-free, paraben-free, allergy tested and dermatologist tested. I like how quickly this moisturizer absorbs into the skin but leaves it feeling soft to the touch and not dry at all. Skin feels nicely hydrated, soothed and moisturized. It is a nice anti-aging moisturizer for those with sensitive skin. 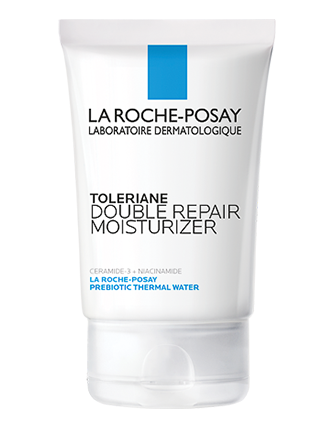 High concentration of La Roche-Posay Prebiotic Thermal Water: with hydrating, soothing, and antoxidant properties. Directions for Use: Use as a daily moisturizer with SPF to hydrate and protect against UV rays. Apply to the face and the neck in the morning. The oil-free, lightweight texture is easily absorbed. The best value is the 75mL 3-month supply. Although it is recommended for all skin types, this is best tolerated by sensitive skin types. It is oil-free and will not clog pores. It is non comedogenic, fragrance-free, paraben-free, allergy-tested and dermatologist tested. Suitable for sensitive skins. 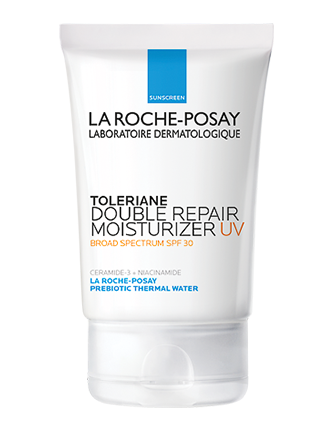 I love this daily broad spectrum SPF 30 moisturizer. It just absorbs into the skin so easily, which makes it so nice to use under foundation. Although these are not mineral sunscreen ingredients, which make it hard for some to use, I don't mind the chemical sunscreen ingredients, which I have has good luck with using. La Roche-Posay is sold at some Walgreens stores in the United States. In Canada they are sold through Shoppers Drug Mart. Like La Roche-Posay on Facebook: https://www.facebook.com/LaRochePosayUSA; Follow La Roche-Posay on Twitter:@LaRochePosayUSA; Follow La Roche-Posay on Instagram:https://www.instagram.com/larocheposayusa/ and Subscribe to La Roche-Posay on YouTube:https://www.youtube.com/user/LaRochePosayUSA.